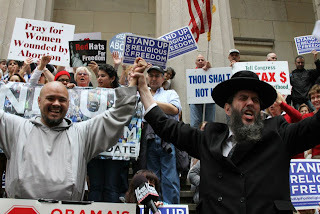 Faith leaders choosing up sides | RabbiLevin.com - Fighting for Morality! Meanwhile, an alliance of 850 Orthodox Jewish rabbis has issued a plea to church leaders and church-goers in South Carolina not to support Mitt Romney for the Republican presidential nomination. The Rabbinical Alliance of America is concerned about Mitt Romney's pro-homosexual leanings, including his recent statement to the Des Moines Register that if elected president he would not work to reinstate the ban on homosexual military service. "There would not be a loyal opposition to Romney," says Levin, "and he would do as much or more damage than Obama -- [and] we all know where he stands on these issues." Levin does not agree with those who say if it comes down to Romney versus Obama, they would vote for Romney. "The vote then becomes something that I'm not obligated to do," explains the rabbi. "If it's a support and endorsement of a quasi-evil, a quasi-poisoner of the wellsprings which is enough to poison our kids, I don't have to do it." Levin says for Christians to stand by and not reject Mitt Romney would be akin to "spiritually shooting our children and grandchildren in the feet." People of faith, he says, must take a stand in South Carolina and the next few states.